A HUMAN PERSPECTIVE The smell of thousands of decaying corpses hung in the air in what was once the thriving seaport of Galveston, Texas. The day before, winds estimated at 130 miles per hour roared through the city. A storm surge of seawater more than 15 feet high pushed a wall of debris across the island of Galveston. Through this turmoil, Isaac Cline’s family huddled in their home. A trolley trestle rammed the house until at last it collapsed, and the waves poured in. Cline survived, but some of his family did not. With a toll of 8,000 human lives, the “Great Galveston Hurricane” would be the deadliest hurricane to hit the United States. The storm date was September 8, 1900. Hurricanes occur frequently in the southern and eastern United States during summer and fall. During these seasons, storm systems with strong winds form over warm ocean water. Seasons have an enormous impact on us, affecting the conditions in the atmosphere and on the earth that create our weather. As the earth revolves around the sun, it is tilted at a 23.5° angle in relation to the sun. Because of the earth’s revolution and its tilt, different parts of the earth receive the direct rays of the sun for more hours of the day at certain times in the year. This causes the changing seasons on the earth. Notice in the diagram to the right that the northern half of the earth tilts toward the sun in summer and away from the sun in winter. Two lines of latitude—the tropic of Cancer and the tropic of Capricorn—mark the points farthest north and south that the sun’s rays shine directly overhead at noon. The day on which this occurs is called a solstice. 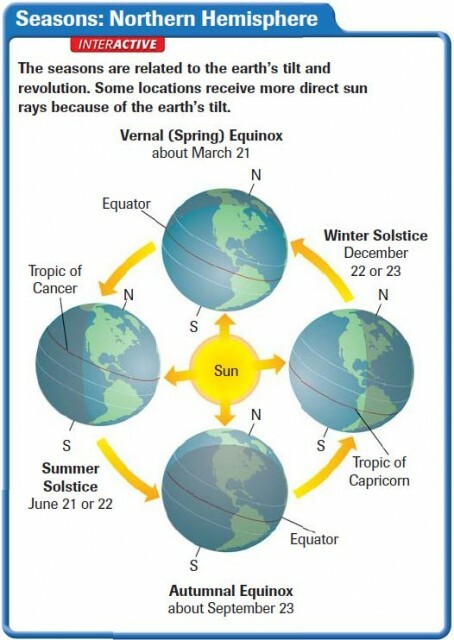 In the Northern Hemisphere, the summer solstice, or the beginning of summer, is the longest day of the year. Winter solstice, the beginning of winter, is the shortest. Another signal of seasonal change are the equinoxes. Twice a year on the equinox, the days and nights all over the world are equal in length. The equinoxes mark the beginning of spring and autumn. Weather and climate are often confused. Weather is the condition of the atmosphere at a particular location and time. Climate is the term for weather conditions at a particular location over a long period of time. Northern Russia, for example, has a cold climate. water vapor This determines whether there will be precipitation—falling water droplets in the form of rain, sleet, snow, or hail. cloud cover Clouds may hold water vapor. landforms and bodies of water Water heats slowly but also loses heat slowly. Land heats rapidly but loses heat quickly as well. elevation As elevation above sea level increases, the air becomes thinner and loses its ability to hold moisture. air movement Winds move the air and the solar energy and moisture that it holds. As a result, weather can change very rapidly. Precipitation depends on the amount of water vapor in the air and the movement of that air. As warm air rises, it cools and loses its ability to hold water vapor. The water vapor condenses, and the water droplets form into clouds. When the amount of water in a cloud is too heavy for the air to hold, rain or snow falls from the cloud. Geographers classify precipitation as convectional, orographic, or frontal, as illustrated in the diagram below. Convectional precipitation occurs in hot, moist climates where the sun quickly heats the air. The heated air rises, and by afternoon clouds form and rain falls. Orographic precipitation falls on the windward side of hills or mountains that block moist air and force it upward. The air cools and rain or snow falls. The land on the leeward side is called a rain shadow because it gets little rain from the descending dry air. Frontal movement causes most precipitation in the middle latitudes. A front is the boundary between two air masses of different temperatures or density. Rain or snow occurs when lighter, warm air is pushed upward by the colder, denser air. The rising air cools, water vapor condenses, and precipitation falls. As air masses warm and cool and move across the earth’s surface, they create weather. Sometimes the clashes between air masses cause storms, which can be severe. They disrupt the usual patterns of life and often cause major property damage and loss of human life. Hurricanes, tornadoes, blizzards, droughts, and floods are examples of extreme weather. Storms that form over warm, tropical ocean waters are called hurricanes—also known as typhoons in Asia. These storms are called different names around the globe: tropical cyclones, willy-willies (Australia), baguios (Philippines), and chubascos (Mexico). Hurricanes are one way heat from the tropics is moved out of the region. Air flowing over an ocean with a water temperature of 80°F or higher picks up huge amounts of moisture and heat energy. As these water-laden winds flow into a lowpressure core, they tighten to form an “eye.” The eye is usually 10 to 20 miles across and has clear, calm skies. But the winds moving around the eye may be as strong as 200 miles per hour. The clouds and winds stretch over a vast area, sometimes as wide as 500 miles. Upper air currents blowing from the east steer the hurricanes in a westerly direction. As the hurricane hits land, it pounds the area with howling winds and very heavy rains. It may also cause a storm surge along coastal regions. This wall of seawater, pushed ashore by the winds, may rise to 16 feet or more. The low-lying coastal regions of Bangladesh in South Asia are especially vulnerable to storm surges from tropical cyclones. Unlike hurricanes, which take days to develop, tornadoes form quickly and sometimes without warning. A tornado, or twister, is a powerful funnelshaped column of spiraling air. Born from strong thunderstorms, tornadoes are capable of immense damage. In a tornado, winds swirl counter-clockwise around a low-pressure center. These winds may reach speeds of 300 miles per hour, blasting apart buildings and lifting objects as large as cars and mobile homes. Generally, tornadoes have small diameters (about 300 feet), travel about a mile, and last only a few minutes. However, the largest and most forceful can reach a mile across and stay on the ground for hours, hopscotching from one location to another. The largest outbreak of tornadoes in the United States occurred during a 16-hour period, April 3 and 4, 1974. A total of 148 tornadoes ripped through the Ohio and Tennessee valleys, killing 330 people. The largest share of tornadoes, about 3 of every 4, hit in the United States. On average, the U.S. National Weather Service counts 700 tornadoes each year. A blizzard is a heavy snowstorm with winds of more than 35 miles per hour and reduced visibility. These weather conditions snarl traffic, endanger livestock, and trap travelers. The greatest snowfall for a 24-hour period was 76 inches (6 feet 4 inches) in Silver Lake, Colorado, in 1921. A snowstorm that lasted from February 13 to 19, 1959, dumped 189 inches (almost 16 feet) of snow on Mt. Shasta, California. Because of their location, some areas of the country are frequently hit with snowstorms that produce huge amounts of snow. For example, the eastern and southern shores of the Great Lakes are snowbelts that experience days and days of heavy snow resulting in enormous snow depths. Around the Lake Erie and Lake Ontario areas, the annual snowfall can be as much as 450 inches (37.5 feet). A drought is a long period of time without rain or with very minimal rainfall. This lack of rain results in crop failures and drastically reduced levels in water storage facilities. In the early 1930s, a drought hit the Great Plains in the United States. Dust storms damaged farms across a 150,000-square-mile region that became known as the “Dust Bowl.” Suffering the effects of a harsh climate, thousands of families were forced to leave their land to find work elsewhere. In 2000, a large portion of the southern United States was struck with a long drought. Northern Texas was particularly hard hit, with 84 straight days of no rain and extremely high temperatures. When water spreads over land not normally covered with water, it is called a flood. Melting snow or rainwater fills streams or rivers until they reach flood stage, the point at which the banks can no longer contain the water. The water then flows into the surrounding area, called a floodplain. Floods take lives every year, especially in low, flat places like Bangladesh, where millions of people live on the flood plains and the delta. In 1993, flooding along the Mississippi and Missouri rivers claimed 50 lives and caused about $15 billion in damage. Nearly 150 rivers and their tributaries were involved. It was the largest flood ever to hit the United States. In the next section, you will learn about how climate affects people’s lives and how humans adapt to changes in climate.